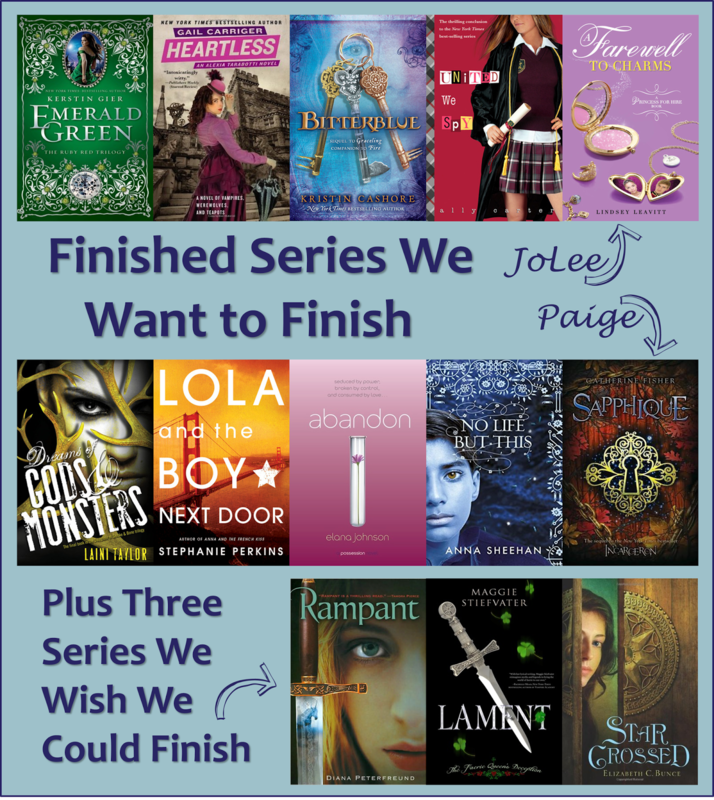 This week's Top Ten Tuesday hosted by The Broke and the Bookish is all about unfinished series. We recently did a post about popular series we quit. This post is a companion to that one. That post is all about the series that we aren't going to finish, and this one is all about the series that we want to finish. We limited ourselves to series that are complete, meaning that all the books have been published. No waiting is necessary, we just need to get in gear and read the last one (or two) books. As a bonus we've included three series that we would finish if we could, but we can't because the last book is not being published. The Precious Stone Trilogy by Kerstin Gier: I love time travel books, and I really enjoyed the first two in this series. Why haven't I read the last one? I just don't know. The Parasol Protectorate by Gail Carriger: I was really moving along in this series a couple of years ago until the library didn't have digital copies of the last two books in the series. I'm reading Carriger's Finishing School series right now, and it really makes me want to read Heartless and Timeless. The Graceling Realm Series by Kristin Cashore: Graceling and Fire are among my favorite fantasies of all time. So why haven't I read the last in the trio yet? I think the answer is that it came out in 2012 which was kind of a dark year for reading for me. The Gallagher Girl Series by Ally Carter: There are six of these books, and I am only missing the last one. I can't just not read the last one, but I am not sure why it's taken me so long to get to United We Spy. The Princess for Hire Series by Lindsey Leavitt: The first two books in this middle-grade series are so darling. I'm sure A Farewell to Charms is just as lovely. The Daughter of Smoke and Bone Trilogy by Laini Taylor: This series is epic. The first two are brilliantly done and I'm certain the third one is too. I'm not sure what's holding me up. The Anna and the French Kiss Trilogy by Stephanie Perkins: Anna and the French Kiss is one of those books I read in one sitting and stayed up way too late in the process. I didn't realize there were two other books until recently when JoLee read the third one, but I still haven't picked up the next ones. The Possession Trilogy by Elana Johnson: I read the first one, went to the release party and got the second one signed, but I still haven't read the third. I don't think my library has it so I have put it on hold and get it from a different library, and I just haven't yet. The Unicorp Duology by Anna Sheenan: A Long, Long Sleep really surprised me. I didn't think I was going to like it as much as I did, but I still haven't sought out the continuation. I would really like to read it and see how all Rose's love troubles settle. The Incarceron Duology by Catherine Fisher: The fact is I still haven't finished the first in this series. I tried to listen to it more than once and the audio medium isn't working for me. I want to get physical or digital copies and try again to read both books. The Killer Unicorn Series by Diana Peterfreund: Rampant was good, and Ascendant was even better. However, Astrid is a total mess at the end of Ascendant. It would be nice to read the next in the series so I could find out how she recovers. The Books of Faerie by Maggie Stiefvater: This series is kind of the same story as The Killer Unicorn Series. Lament was good, and Ballad was even better but Deirdre is a total mess at its conclusion. I'm not sure what the story is on Requiem. It had a publication date. Then it didn't. I had what I thought was a hint about it from Maggie's publicist at BEA, but haven't heard anything since. So, yeah. I really just don't know. The Thief Errant Series by Elizabeth C. Bunce: Here's another of my favorite fantasy series (and Paige's too). The second in the series ends with a huge surprise, and I may never get to know what comes of that unforeseen twist.